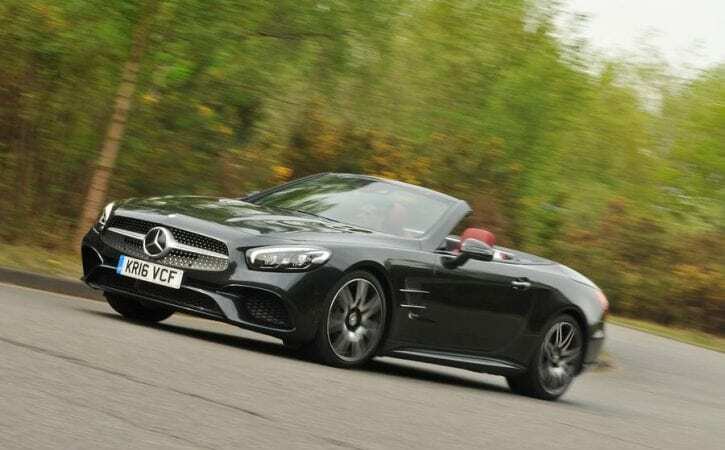 It’s the cheapest way into Mercedes’ facelifted two-seat convertible SL, although, anybody opting for one is unlikely to be running an Economy 7 energy tariff back at the family pile. Yes, the £73,815 SL 400 AMG Line isn’t exactly cheap, but then nothing about it says as much. Under the bonnet is Mercedes’ 3.0-litre twin-turbocharged V6 petrol engine, which is now good for 362bhp and a 0-62mph sprint time of less than five seconds. That peak power output is 35bhp up on the previous – and saggier-faced – 400. Also now fitted as standard is Mercedes’ latest nine-speed 9G-Tronic automatic gearbox, while extensive styling revisions have been applied to the SL’s bonnet, grille, front bumper and headlights. Standard equipment is improved, too, with features such as LED headlights, a panoramic roof, new ambient interior lighting and emergency city braking thrown in. It might be six cylinders and nearly £100,000 down on the range-topping SL 65, but the 400 feels every bit the luxurious open-top that it should. Its blown V6 doesn’t produce the slapping burble of the AMG 63, nor the gravelly rasp of the 65 at its pipes, but push it hard and its purposeful, distinctive V6 howl is still addictive. It leaps forward and pulls with vigour towards its redline, sporting mid-range muscle and a sprint time that both feel more than adequate on road. The advantage of a metal folding roof is improved refinement, and with it closed there’s very little road or wind noise spoiling the serenity. That the SL’s roof can now be raised or lowered in less than 20 seconds at speeds of up to 25mph or so is another new feature, although, you’re still required to be at a standstill to initiate the procedure either way. The days of cursing before throwing your door open and scuttling back around to the rear on order to ram the boot divider down are over, too; it’s done automatically now. And vitally, with the roof down and optional £525 wind deflector specced, the SL has a supremely wind-free cabin, even at motorway speeds. Spending a further £575 on Mercedes’ Airscarf will ensure a warm neck to go with it. The disadvantage of a metal roof, of course, is weight, but the SL disguises it well. Even without Mercedes’ £3080 Active Body Control with Curve Function option that physically tilts the SL around corners, our car’s steel springs, lowered by 10mm and stiffened in AMG Line form with adaptive dampers, did an impressive job of keeping the SL’s body flat. Its steering isn’t sports car-quick or communicative, but there’s enough urgency from the front wheels and liveliness from the rear axle – especially with the big roof’s weight tucked rearward – to have fun with the car. In its Comfort mode the SL rounds off its strong performance and impressive refinement with ride comfort that’s compliant enough for its intended continent-crossing use. It struggles most over sharp edges at low speeds, but the suspension is never noisy or jarring from inside. In fact, the SL’s cabin is wonderfully comfortable. The driver gets ample electric adjustment for his or her comfortable, supportive seat, and there’s masses of space for two tall adults. The boot swallows 364 litres – two or three soft weekend bags – roof-down, or easily a set of golf clubs in the 504-litre space with the roof up. If there’s a chink in the SL’s armour, it’s that its cabin is starting to look and feel a little dated next to those of its rivals’, both in terms of quality and infotainment. It’s not surprising; this is a facelift after all, and doesn’t benefit from Merc’s latest materials and Comand system. Even so, the addition of Apple CarPlay as an option improves matters. With an SL 400 on your mind, rivals such as Porsche’s pricier 911 Cabriolet and Jaguar’s cheaper F-Type S Convertible may also be occupying the grey matter. The Jag shouts louder, and keeping up with the 911 cross-country would be a challenge, while the recently revisited Porsche also has quality and better infotainment on its side.